Peterborough Northern Star goalscorer James Hill-Seekings (stripes) in action against Deeping Rangers. Photo: Tim Gates. There was a massive sigh of relief at Carter’s Park yesterday (January 28) after Holbeach United put a five-game losing streak to bed in spectacular style. 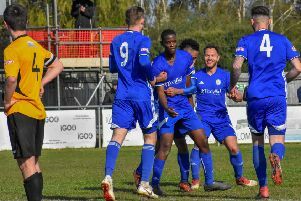 The troubled Tigers couldn’t have wished for more compliant opposition though as Harrowby United had also lost their previous five games, including a 9-0 duffing at Sileby Rangers three weeks ago. Connor Murphy (stripes) breaks forward for Peterborough Northern Star against Deeping Rangers. Photo: Tim Gates. And Holbeach matched that scoreline after taking the lead in the United Counties Premier Division match through Josh Ford after just 38 seconds. Ford went on to claim a hat-trick as did midfielder Spencer Tinkler, while there were first goals for the club for Zak Munton and Dan Jenkins. Ollie Pinner completed the scoring for Holbeach who are seventh in the table, one place above Wisbech and one below Yaxley. Yaxley’s six-match winning run was surprisingly ended by Cogenhoe with the home side racing into an early 3-0 lead that they never relinquished. Wisbech were also beaten, 3-1 at home to ON Chenecks. Michael Frew bagged the Fenmen’s consolation goal. Peterborough Sports maintained their eight-point lead at the top with a 4-1 win over Kirby Muxloe at PSL. Avelino Vieira (2), Josh Moreman and Stuart Eason scored the goals, all of them arriving in the first-half. Vieira has now bagged 100 goals for the club. Second-placed Deeping Rangers were given a scare by out of form Peterborough Northern Star at Chestnut Avenue. Wilkins Makate of Peterborough Northern Stra battles for possession in the 3-1 United Counties Premier Division defeat by Deeping Rangers. Photo: Tim Gates. The city side lead at half-time through James Hill-Seekings, but second-half strikes from David Burton-Jones, Tom Waumsley and Jason Kilbride delivered the points to Deeping. Blackstones made it three Division One wins in a row under new manager Andy Lodge, but they will have tougher tests to come than a trip to rock bottom Stewart & Lloyds. Former Posh youngster Dan French was among the scorers for Stones in a 2-0 win. Stones have now moved above local rivals Bourne into 14th place. Cogenhoe United 3, Yaxley 0. Wisbech Town 1 (Frew), Northampton ON Chenecks 3. Stewarts & Lloyds 0, Blackstones 2.